Turkey is banning the use of foreign currencies in the country's property market as it looks to stem the dramatic fall of its own currency, the lira. The move came as Turkey's central bank increased interest rates sharply in an attempt to curb the tumbling lira. Thursday's decree, which was published in the government's official gazette, said all current agreements in the property sector made in foreign currencies must be changed within 30 days. 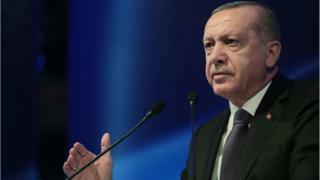 He also criticised Turkey's central bank, accusing it of failing to control inflation and urging it to cut interest rates just hours ahead of its announcement that it was raising rates to 24%. "As of today I have not seen the central bank fix inflation rates as they promised," Mr Erdogan said. "Interest rates are the cause, inflation is the result. If you say 'inflation is cause, the rate is the result', you do not know this business, friend," he added. Turkey's lira jumped sharply following news of the rate increase. The new decree received limited attention from people in Turkey as most property sold or rented in foreign currency tends to be either commercial or high-end. Social media users commented that even if contracts were to change on paper, people who have valuable property would continue to receive their rent in dollars. Those who cannot "were renting out in Turkish liras anyway", one said. Critics of the government called on the authorities to apply the new rule to its own agreements too. The changes are expected to affect mostly businesses, and many retailers have previously criticised the dollar-based rent policy in shopping centres, where it has been blamed for the bankruptcy of at least one major company. Shopping centre managers, however, say the change could be dangerous as it could be costly to repay bank loans taken out in dollars. Car rental companies, who would also be affected by the decree, are "in shock", according to Turkish news website Dünya. A representative from the industry was quoted as saying that the move could "drive the industry to calamity". Last month, Turkey's weak currency received a small boost after Mr Erdogan raised tariffs on US imports including cars, alcohol and tobacco. Mr Brunson has been held for almost two years because of his alleged links to political groups that are outlawed in Turkey, which accuses the US of trying to bring it "to its knees" over the administration's demands. Experts have also warned that its weakness could infect other emerging market currencies.